Colossoma macropomum (E.L. Maia and D.B. Rodriguez- Amaya). Carotenoid Composition of the Tropical Fruits Eugenia uniflora and Malpighia glabra (M.L. Cavalcante and D.B. Rodriquez-Amaya). An Overview of Aseptic Processing of Particulate Foods (N.G. Stoforos). Diabetes: Food Nutrition, Diet and Weight Control (A.A. Khan). Current Approaches to the Study of Meat Flavor Quality (A.M. Spanier). Consumer Acceptability of Algin Restructured Beef (J.A. Maga, L. Dwyer and G.R. Schmidt). Formation of Dialkylthiophenes in Maillard Reactions Involving Cysteine (G.P. Rizzi, A.R. Steimle and D.R. Patton). Listeria monocytogenes and its Fate in Meat Products (J.N. Sofos). Subject Index. 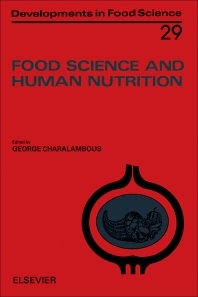 This volume brings together 63 papers dealing with chemical, biochemical, sensory, microbiological, nutritional, technological and analytical aspects of foods for human consumption. The information presented is of considerable interest to all researchers, analysts, nutritionists, manufacturers, packagers, etc., involved in the perennial effort to gain more insight into the correlation between food science and human nutrition. (Limitation of space allows only a selection of papers to be mentioned).